What is an Integral bridge? 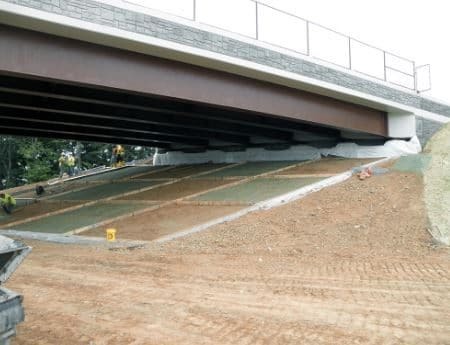 Integral bridges are constructed without any joints between spans or between span and abutments. The superstructure along with abutments acts as single structural element. 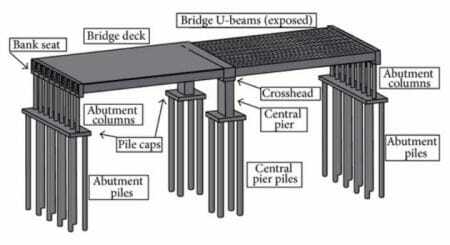 Integral bridge with frame abutments acts like portal frame where moments, shear force and axial loads transfer directly to the supporting structure from deck of bridge. The frame abutments retains the backfill behind it like retaining walls. Spread footing or embedded wall footing is preferred as foundation for the frame abutments. 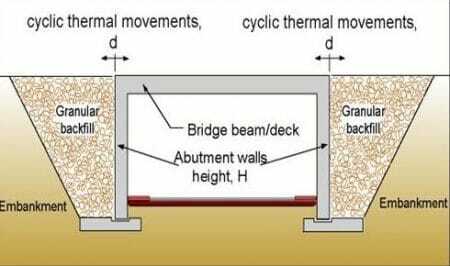 When there is thermal expansion or contraction, the beams of deck will react and produce horizontal displacement. To prevent the displacement on foundation, the abutments must be built with some flexibility. Even if there are intermediate supports portal type configuration does not changes. The reinforced concrete abutment is stiff in nature which is not suitable in this case. Use of steel sheet piles is the best alternative for this type of abutments. Soil pressure behind the abutments should also considered in the design. In Flexible support abutments, Post holes are created around the piles up to the depth of piles. The posthole should provide enough space for the pile to move horizontally during thermal expansion or contraction. This will eliminate the soil and foundation interaction. The hole is made of precast concrete rings for larger piles, UPVC or polythene piping for smaller piles. A duct is provided from the end screen wall to inspect the durability of pile inside the post hole. The piles should also be checked against buckling. The holes around piles should not be filled with anything and also the holes should not have contact with end screen wall then only the movement of pile inside the hole is possible. If the soil in front of the abutment if of vertical facing then reinforcement should be provided for the earth. Integral bridge with bank pad abutments is another type in which stiff portal frame type arrangement can be constructed. In this type, the end supports are fully integral with the deck beams but these supports are not fixed in the ground. They are allowed to slide and rotate. These supports can slide during thermal expansions or contraction and they also can rotate due to bending moment from the deck beams. This sliding and rotation may affect the bearing capacity of soil, to avoid this bearing pressure of soil at serviceability limit state are kept lower than the normal static values. The bank pad abutment forms an end screen wall behind which backfill is filled. The width of end screen wall is equal to width of pavement above it. The soil and end screen wall interaction is considered only when the bank pad abutments are built on pile foundations. In this case also end screen wall and deck beams are integral with each other but end screen wall does not give support to the deck beams. Structure with Bearings which can accommodate horizontal displacement is provided as support to the deck beams. Since the support is separate the soil- substructure interaction is negligible in this case. 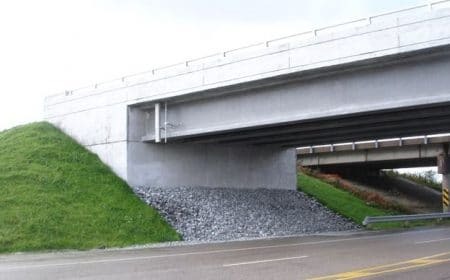 When compared to conventional bridges, construction costs and maintenance costs are much lower. Construction of integral bridges is simple and rapid. Lesser tolerance restriction due to elimination of bearings and expansion joints. If integral bridge is constructing in place of existing old bridge, the foundation of old bridge can be used as foundation for integral bridge. Hence cost of project reduces. Elimination of water leakage on critical structural elements can be done using drainage layer provided behind the integral abutments. The vehicle riding quality on integral bridge is more comfortable and smooth since there are no expansion joints. Following are some limitations to be considered while designing integral bridges. Integral bridges are not suitable in zones where there is chance of expansion/contraction of more than 51mm during temperature variations. They are not preferred when subsoil or embankments are of poor strength. Geometry of the bridge and material used for the construction play key role in case of integral bridges. They are responsible for the displacement affects in the bridge. There is a chance of formation of plastic hinges in piles due to high stresses of expansion and contractions results in reduction of axial load capacity of piles. The foundation should be designed considering this point. 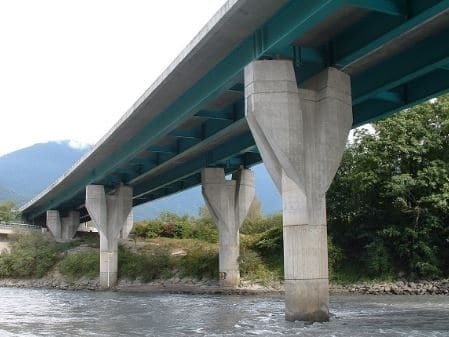 Integral abutments are suitable for the bridges up to the length of 40 m for steel girder bridges and length up to 50 m for concrete girder bridges.